Take a look at our four commandments you absolutely must consider before deciding what the best fishing rod is for your own needs. 1. What type of fish do you like to catch? 2. What rod features / parts do you need? 3. What fishing do you do? 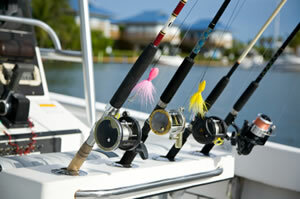 Typically most people who enjoy fishing don’t venture far from home for most of their fishing trips. This means that you may be close to a lake, river or ocean and obviously the types of fish are going to vary accordingly. It helps if you know in advance what kind of fish are nearest to you so you can pick the right rod for your needs. Our pro tip is to focus on one type of fish at a time, learn as much as you can about them and this will help you catch them much more effectively since you’ll know the right rod, line and bait to use. What features do you need? It’s a good question to ask yourself. Understanding what tackle you need is crucial for successful and frustration free fishing. If you want to go after larger fish then you will need a baitcaster reel. If you need a short rod it’s most likely because you’re targeting fish that will give you a fight. Do you fish by the lakeside with a chair and a tent in tow? Perhaps you fish from your local pier, or from the beach. Whatever type of fishing you do require different tackle. The acidity of the open ocean isn’t suitable for fresh water rods and vice versa. Do your research here and it’ll save you money and frustration. 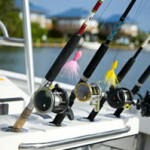 In general your budget will decide what rod and tackle you can ultimately afford. However we believe that your budget should also vary based on how often you plan on fishing. If you don’t plan on fishing regularly it makes sense to not spend thousands on all your tackle. However if you plan on going regularly then we recommend spending an amount of money that saves you in the long run by not having to replace or repair damaged and broken tackle. You can buy a good beginners rod for less than $30.00 to get used to what you’re doing, this means that the sport and loved hobby is more accessible to newcomers today than ever before. No matter what your budget there’s something for everyone – as we said though it’s more sensible to define your budget based on fishing frequency.